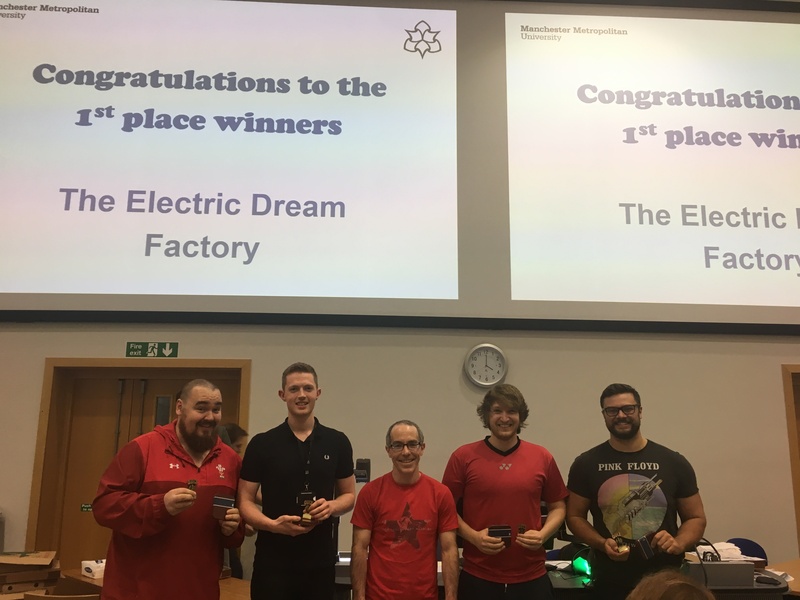 The Big Scieng Quiz 2.0 was again a great success, thank you to all of the teams for all for your enthusiasm and contribution! To get the brain in gear the contestants faced a tough round of the Engineering, Geography and History questions, our host Sam Illingworth, declaring ‘Who broke the speed of sound?’ one of the most difficult of the whole quiz! A set of Chemistry, Biology and Physics questions followed before the Manchester Music round (with a bonus prize for spotting the non-Manchester band). After a break for plenty of pizza, there was an eclectic round of Sport, Exercise Science, Computing and Maths, with questions on prime numbers to David Beckham’s metatarsal injury. The quiz ended on some general knowledge and the Famous Scientist picture round. ‘The Phenol Countdown’ took the title of Best Team Name, with ’50 Shades of Ph’ a close runner up. ‘And in 1st Place’ caused some confusion when collecting their 3rd place prize, and second place was awarded to Ellison’s Angels. Congratulations to our winners (for the second year in a row! ), the team The Electric Dream Factory. Every school in the Faculty attended, with a mix of undergraduate and postgraduate students, technical and professional services staff. Faculty Pro Vice Chancellor Andy Gibson said "I was delighted to hear that the quiz was again a success! It sounded like great friendly competition, Congratulations to the winners!" A huge thank you to our excellent Quiz Master, Sam Illingworth, who laid down the quiz law ‘firmly and harshly’ to keep all contestants in line. We are planning a Big Scieng Quiz: Big Fat Quiz of the Year in January 2019, so keep your eye out and sign up!